For other uses, see Crowd control (disambiguation). 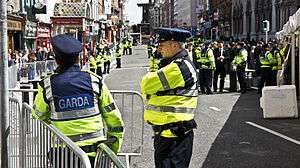 Garda Síochána officers on guard duty as a cleared street in Dublin, Ireland when President Obama visited the country in 2011. 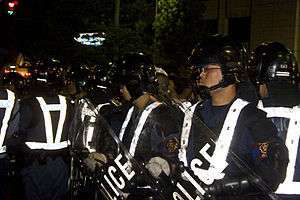 Kyoto Prefectural Riot Police Unit officers on duty during the Gion Matsuri 2008 festival. 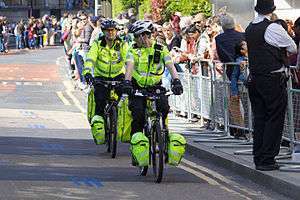 Crowd control is a public security practice where large crowds are managed to prevent the outbreak of crowd crushes, affray, fights involving drunk and disorderly people or riots. Crowd crushes in particular can cause many hundreds of fatalities. Crowd control can involve privately hired security guards as well as police officers. Crowd control is often used at large, public gatherings like street fairs, music festivals, stadiums and public demonstrations. At some events, security guards and police use metal detectors and sniffer dogs to prevent weapons and drugs being brought into a venue. Materials such as stanchions, crowd control barriers, fences and decals painted on the ground can be used to direct a crowd. Keeping the crowd comfortable and relaxed is also essential, so things like awnings, cooling fans (in hot weather), and entertainment are sometimes used as well. For controlling riots and demonstrations, see riot control. Specific products that are used to implement line management and public guidance in high traffic areas include retractable belt systems (which incorporate a stanchion post and the retractable tape) and wall mount systems (also incorporating a retractable belt but are surface mounted). Post and rope systems are also popular, especially in banks and theaters. A crowd controller is also another name for a bouncer or doorman. ↑ Benedictus, Leo (October 3, 2015). "Hajj crush: how crowd disasters happen, and how they can be avoided". The Guardian. Retrieved October 4, 2015. ↑ "Three injured, 60 found with drugs at Future Music". The Sydney Morning Herald. Retrieved 2016-05-21. ↑ Sanders, Bill (2005-04-01). "In the Club: Ecstasy Use and Supply in a London Nightclub". Sociology. 39 (2): 241–258. doi:10.1177/0038038505050537. ISSN 0038-0385. ↑ Berka, Justin (2007-06-21). "AT&T's terrible secret of space crowd control". Ars Technica. ↑ Aschoff, Susan (2005-07-15). "Barricades at BayWalk make protesters wary". St. Petersburg Times. ↑ Burgess, Matthew (2008-06-02). "Police probe bouncer attack". The Age. ↑ Crosse, Mark (1992-04-05). "NIGHTCLUB BOUNCERS OF THE 90S IT'S NO LONGER THE GOON BY THE DOOR". Fresno Bee.